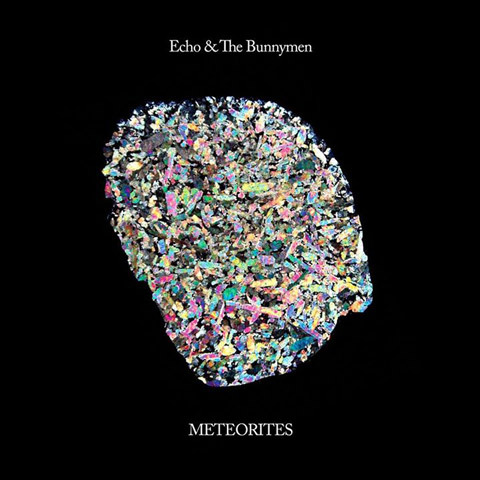 The latest release from Echo & The Bunnymen, The Stars, The Oceans and The Moon, is a bit like a greatest hits record meets MTV Unplugged. Echo's frontman, Ian McCulloch, and guitarist, Will Sergeant, worked out fifteen tracks (two originals and thirteen remakes) representing the breadth of the band's post-punk psychedelia output. While remaking one's own songs is hardly an original concept, the work McCulloch and Sergeant have put into this collection is thought-provoking and enjoyable, if occasionally flawed. What The Stars, The Oceans and The Moon proves is that, while age has dulled some of the band's edgier elements, redoing these tracks with "strings and things" has brought forth some interesting lyrical and compositional components that the original recordings failed to highlight. The opening track, a remake of "Bring On The Dancing Horses", arguably Echo's most famous song, is just plain terrible. Though McCulloch's voice has ripened to perfection, with age and cigarettes, the remakes' ridiculously bad synth/drum beat underpins a guitar riff which sounds exactly like Echo doing a drunken cover of Michael Jackson's "Black Or White". It is nothing short of awful. Cynics about Echo's post-1980s output will feel validated by "Horses'" sheer incompetence. Fortunately, track one's failure sets-up a masterful return to form on much of the rest of the album. Track two, "The Somnambulist", is one of The Stars, The Oceans and The Moon 's two original tracks. What this new track shows is a band who hasn't lost its pop sensibility or its ability to make epic music. The massive bass, the shuffling beat and soaring outro are classic Echo. Though slightly too flashy to become an actual Echo classic, the bones of "The Somnambulist" are pure Echo & The Bunnymen. This original sets-up track three, a redemptive remake of one of Echo's late-90s Britpop mistakes, "Nothing Lasts Forever". "Nothing Lasts Forever," which was originally released in 1997, seemed like a reactionary response to the popularity of acts like Oasis and Coldplay. The irony of Echo aping those lesser acts is that neither Oasis nor Coldplay could have succeeded without the heavy lifting McCulloch and company did on Ocean Rain, Porcupine and Crocodiles. Where the original version of "Nothing Lasts Forever" felt desperate, this new version reveals a band with all the wisdom, hard earned-cynicism and musical growth the lyrics suggest. McCullough and Sergeant have grown into this track and the glockenspiel, dreamy atmospherics, and McCullouch's rusty delivery turn a saccharine original into a genuinely sweet pop tune. The Stars, The Oceans ... "Lips Like Sugar" is a mediocre remake of a classic song. The original could be released on pop radio today (or more likely on a tv/film soundtrack) and have a chance of charting. While this overproduced remake is fine and doesn't diminish the original's pop glory, the new version is the embodiment of redundancy. There is an interesting introduction of militaristic marching beats into a couple of the songs, "Rescue" and "Angels & Devils", which really adds a new aspect to the two classic Echo tracks. Other new additions also hold up quite nicely. The slowed-down acoustic strumming and pipe organ sound of "Seven Seas" adds a sea shanty element to the original that fits nicely with the song's nautical theme. Similarly, "The Cutter" adds some electronic elements which work nicely with the song's massive bassline and McCulloch's baritone delivery. Less interesting are elements like the addition of a descending scale to "Angels & Devils" which turns the lurching, staccato original effectively into an Echo & The Bunnymen cover of "You Only Live Twice". The titular "Ocean Rain" was originally a string-heavy affair and the remake here is a lovely, very similar, cover of the original, strings and all. McCulloch's voice and lyrics are brought to the fore and the track benefits from their amplified presence but ultimately does nothing to improve on the rawer original version. This "Ocean Rain" remake is exactly the sound fans would hope to hear when seeing Echo's current incarnation perform live. The album closes with"The Killing Moon", probably Echo's most popular song among its younger audience due to the track's inclusion on the Donnie Darko Soundtrack. This remake is stripped down to piano and symphony but is dominated by McCulloch's gorgeous voice. The effect is a bit like combing Donnie Darko's other standout track, Gary Jules' piano cover of "Mad World", with the gothic majesty of "The Killing Moon". It is a thing of beauty but ultimately feels a little calculated, as if McCulloch made this cover solely in the hopes of it being included on the soundtrack of some future film or program. While Echo have never achieved the success they deserved, McCulloch's behavior over the course of three decades worth of press interviews, reveals a personality closer to Kanye West than the kind of sensitive soul one would expect from the author of "Ocean Rain". As a result, I think this album may be received as less a return to form than a return to past glories. If that happens, it will be unfortunate. There is a lot of amazing stuff going on here because The Stars, The Oceans and The Moon is much more than just simple remakes. Instead, it feels a bit like fresh tendrils digging into familiar soil, something familiar in search of something new. If anything, listening to The Stars, The Oceans and The Moon led to me revisiting the original versions of "Bedbugs and Ballyhoo" and "Zimbo", two songs I usually skip past, to compare and contrast the new with the old. I hope whatever McCulloch and Sergeant do next is equally as pleasurable. A really interesting review, I'm swayed now to at least give this a go. It seems, judging by the recent gig I attended, that you just have to accept the current Bunnymen, with their flaws, or simply to decide to draw a line after the 'grey album' and pretend the following years never happened.